Malawi is a small country with an estimated land area of 11.8 million hectares, of which Lake Malawi occupies one-fifth of the total. Out of 9.4 million hectares of land, approximately 5.3 million ha, or 56 percent, is cultivable. The Malawi economy is characterized by a high dependence on agriculture, a narrow industrial base and weak intersectoral linkages. The agricultural sector currently accounts for about 42 percent of GDP and 81 percent of export earnings, while the manufacturing sector accounts for 12 percent of GDP. Almost three and half decades after independence, Malawis economy remains fragile, highly subsistent and uncompetitive. Apart from suffering from a negative balance of payments owing to poor trade performance, the country is faced with a heavy debt burden, as indicated by a rise in the debt service ratio from 14.7 percent in 1994 to 20.6 percent in 1998. Declining agricultural productivity has resulted in increased importation of maize, the countrys major staple, in recent years (except in 1999 and 2000). The decline in economic performance has translated into a deterioration in peoples welfare most of whom (85 percent) live in rural communities. The countrys GDP per capita has declined from US$210 in 1992 to $200 in 1997 and to approximately $160 in 1999, while income disparity, as measured by the Gini ratio, has worsened from 0.48 in 1968 to 0.62 in 1995. The widening income gap between individuals coupled with rising inflation implies a worsening situation of food insecurity. The rising cost of capital owing to inflation-driven rates of interest has made both small-scale and large-scale farming uncompetitive in Malawi. A lack of local manufacturing of important inputs such as fertilizer, feed and agricultural chemicals has worsened the situation. While maize has been the major food crop in terms of the policy agenda and hectarage planted, tobacco has been, and continues to be, the dominant cash crop in the economy accounting for approximately 63 percent of the countrys total export earnings. Tea and sugar are other important cash crops accounting for 8 percent and 7 percent of export earnings, respectively. Livestock production, which contributes about one-fifth of the value of total agricultural production, consists mainly of subsistence grazing of sheep, cattle, goats, poultry and pigs (WTO, 2002). Malawi agriculture is composed of two main subsectors: small-scale farmers and estates. Smallholder farmers comprise an estimated 2 million farm families and cultivate about 4.5 million hectares of land. Smallholder production is highly subsistent. It is characterized by low levels of input and low output levels. Approximately 25 percent of smallholder farmers cultivate less than 0.5 ha on average; 55 percent cultivate less than 1.0 ha; 31 percent cultivate between 1.0 and 2.0 ha; and 14 percent cultivate more than 2.0 ha. Despite being resourcepoor, smallholder farmers produce about 80 percent of Malawis food and 20 percent of its agricultural exports. The estate subsector is the nations principal foreign exchange earner. While it contributes only about 20 percent of the total national agricultural production, it provides over 80 percent of agricultural exports mainly from tobacco, sugar, tea and, to a lesser extent, tung oil, coffee and macadamia. The estate subsector operates on leasehold or freehold land. Agricultural development is an important component of the Governments Vision 2020 and Poverty Reduction and Growth Strategy. The Governments Agricultural and Livestock Development and Action Plan of 1995 was recently reviewed by the Ministry of Agriculture and Irrigation in announcing its Agricultural Sector Investment Program in 1999. Policies are based on greater private-sector development. Restrictions on the growing and marketing of crops, such as tobacco, have been substantially relaxed under its market liberalization policy. The monopoly of the Agricultural Development and Marketing Corporation in purchasing maize and some other crops from smallholders has been eliminated, and progress is being made towards the ultimate goal of privatization provided a solution can be found to the problem of non-profitable marketing operations in remote regions. A National Food Reserve Agency (NFRA) was established in 1999, which effectively operated as a state marketing board by purchasing maize within set price bands. The price bands were terminated in 2000 and replaced by indicative prices. The Special Crops Act, which had reserved the production and marketing of high-value crops to the estate sector and restricted the entry of smallholders to these activities, was abolished in 1995. Exchange rate reforms, which allowed the countrys currency to depreciate, also reduced the implicit tax on agricultural exports (WTO, 2002). Supply of all inputs has been decontrolled, and most subsidies have been removed. The removal of fertilizer subsidies reduced its use by farmers, and the Government responded with the Starter Pack Initiative in 1998 to provide farm extension support and free fertilizer and seeds to the rural poor primarily to help alleviate poverty. Initially supplied to all farmers, the scheme contributed to the bumper maize harvests in 1998 and 1999, generating large surpluses that were bought and stored by the NFRA. The Starter Pack Program has now been redesigned by targeting the beneficiaries and is now called Targeted Input Program (WTO, 2002). Despite some policy setbacks, the Government remains committed to trade and investment liberalization as part of its longstanding recovery programme that began in the mid-1980s and deepened in the mid-1990s. Since embarking on trade liberalization in the late 1980s, Malawi has substantially rationalized its tariff structure by lowering and amalgamating duty rates. Maximum MFN tariffs of 70 percent were cut to 45 percent in 1988, and to 40 percent in April 1996, when the number of bands was also reduced. From April 1997, the maximum tariff was lowered further to 35 percent, and tariffs were eliminated on raw materials used in manufacturing. Consequently, unweighted average tariffs declined substantially during the late 1990s, from 21 percent at the end of 1997 to 15.8 percent at the end of 1998. The maximum tariff rate is currently 25 percent (WTO, 2002). Other policy measures included elimination of restrictions on payments for current transactions and transfers, and reduction of the scope of export licensing. Malawi is an original Member of the WTO. It is also a signatory and beneficiary of a number of bilateral and multilateral trade agreements. These include the SADC Trade Protocol, COMESA, the Malawi-Zimbabwe bilateral trade agreement and Malawi-South Africa bilateral trade agreement, the Cotonou Agreement between the EU and the ACP countries, and the US-AGOA initiative for concessional exports to the US market. Malawis membership of overlapping regional and bilateral arrangements with different geographical coverage, trade liberalization agendas and trading rules makes its trade regime more complex (WTO, 2002). Furthermore, as a developing country and a member of the WTO, Malawi is entitled to utilize the various GSP schemes offered by developed countries. Despite Malawis membership in these organizations, inter-regional trade has not been a strong component of Malawis exports. In the context of the UR, Malawi bound tariffs on all agricultural products at a ceiling rate of 125 percent, except for a few products with ceiling rates of 50 percent (rye, barley and oats), 55 percent (cocoa paste, butter and chocolate) and 65 percent (cocoa powder). Tariffs were bound on less than 1 percent of tariff lines for non-agricultural products, at ceiling rates between 30 and 65 percent Other duties and charges on all these products are bound at a ceiling rate of 20 percent (see Table 1). As an LDC, Malawi made no commitments to reduce these ceiling bindings. Applied tariff rates are well below these ceiling rates, particularly for agriculture. The simple average MFN tariff was almost 14 percent in 2000/2001, down from almost 16 percent in 1997/1998 and 21 percent in 1996/1997. Virtually all tariffs are ad valorem. The tariff structure is escalatory, with six bands; rates of zero or 5 percent apply to necessities, and 10 percent to intermediate goods. The maximum duty rate applied to consumer goods is currently 25 percent. With a coefficient of variation of about 0.7, tariffs were moderately dispersed in 2000/2001. Applied tariffs on agricultural goods are slightly higher than the average for manufactures, at 15.2 percent. The structure of applied tariffs is shown in Table 2. The lowest tariffs are applied on imports of oilseeds and cereals on average, while higher tariffs are applied on processed food products. Under its bilateral and regional trade agreements such as the SADC Trade Protocol, COMESA, the Malawi-Zimbabwe bilateral trade agreement and the Malawi-South Africa bilateral trade agreement, some of Malawis imports enter at preferential rates below the MFN applied rates quoted above. COMESA is intended to be a customs and monetary union. Its Free Trade Area was launched on 1 November 2000, and Malawi met this deadline. The free trade agreement under COMESA provides for across-the-board duty free trade on all products as long as the rules of origin criteria have been met. The customs union is to be implemented by 1 November 2004 with a CET consisting of four tariff bands: zero, 5 percent, 15 percent and 30 percent (on capital goods, raw materials, intermediate goods and final goods, respectively). However, since most COMESA members, including Malawi, have maximum tariff bands below 30 percent, discussions are under way on the possibility of reducing the agreed CET rate on final goods (WTO, 2002). As regards the SADC Trade Protocol, tariff reductions were started in September 2000 by Mauritius and South Africa, and by July 2001, they had been followed at different times by all other Trade Protocol members except Mozambique (Imani-Capricon, 2001). The aim of the Protocol is to reduce tariffs for 85 percent of all trade to zero by 2008 and 98 percent of all trade by 2012. Malawis offer to non- SACU countries is presented in Table 3. All imports including those from COMESA and Zimbabwe (under the bilateral trade agreement) face a surcharge of 20 percent, but this can be claimed back by the importer. Source: Imani-Capricon Economic Consultants (2001). Bilateral tariff arrangements especially with its major traditional trade partners, South Africa and Zimbabwe, vary in their scope and extent of reciprocity. Between Malawi and Zimbabwe, there is a reciprocal agreement providing for duty-free trade on all goods, provided that they (1) meet the origin criterion which is 25 percent local value added and (2) conform to the required national standards of the importing country. This appears to present a two-country free trade area within the larger (COMESA) free trade area, the difference being in the rules of origin requirement. Malawi has raised concern with the weak certification rules and the absence of any provision for dispute settlement, and accordingly, it has urged that the agreement be renegotiated to tighten up on manufacturing certification and include cumulation, dispute settlement mechanisms and a list of sensitive products (Imani-Capricon, 2001). A revised draft agreement has been prepared and is awaiting ratification by both parties. The bilateral trade agreement between Malawi and South Africa is asymmetric, providing the former with duty-free status for its commodities as long as they met the 25 percent local value added, while the latter receives only MFN treatment. This bilateral agreement will remain in force until 2008 when SADC tariffs reach zero. Because a large component of Malawis trade from SADC countries, excluding South Africa, already receives COMESA preferences, the Malawi reductions under the SADC Trade Protocol do not involve major tariff cuts overall. After eight years, the trade-weighted average tariff on imports from SADC countries, excluding South Africa, would fall from 2.5 percent to 1 percent. However, because South Africa previously received no preferences from Malawi, the average tariff on imports from South Africa would drop from 10.4 percent to 2.9 percent. These falls are back-loaded and will not commence until the mid-2000s. The main direct impact of SADC on Malawi will thus be the extension of dutyfree access to imports from South Africa, by far its main single trading partner (WTO, 2002). Malawi notified its anti-dumping legislation to WTO in 1995 and is currently redrafting it to bring it into line with WTO requirements (WTO, 2002). Malawi has no safeguard legislation. It does not have access to the SSG clause in the AoA because it made use of the option to use ceiling bindings. Owing to pressure from local producers especially livestock and tobacco, the Government has sometimes temporarily imposed a ban on imports of poultry and tobacco, respectively. The Government has a contract with Société Générale de Surveillance (SGS) to carry out, in the country of supply, pre-shipment inspection (PSI) of the quality, quantity, classification, value and related services of imported goods. The contract, in effect since June 1996, has a WTO PSI agreement appended to it. It has clear guidelines, procedures and standards that importers, suppliers and SGS have to observe to speed up the inspection process. Pre-shipment inspection will result in either a Clean Report of Findings or a Discrepancy Report. A Clean Report of Findings is required for importers in Malawi to clear goods through customs and for exporters to collect payment. Malawi does not apply TRQs. Malawi operates a liberal import and export licensing system with restrictions largely based on health, safety and national security reasons. Only 13 commodities representing about 5 percent of all goods imported into Malawi require an import licence. These goods are military, naval, air force or police uniforms; radioactive substances; mist nests for wild birds; wild animals, trophies and products of such animals; live fish; compound products for use as animal feed (with exceptions); live poultry and eggs; meat (with exemptions); dieldrin; aldrin; and salt. Since 1994, the exchange rate system was liberalized, allowing market forces to determine the value of the Kwacha. In Malawi, since implementation of the World Bank and IMF-supported structural adjustment reforms, only very limited support has been provided to producers since the early 1990s. Following the commitments under the Agricultural Sector Assistance Credit (ASAC), the Government adopted a process of phasing out recurrent subsidies. The commitments under ASAC were that the overall subsidy rate on fertilizers was not to exceed 30 percent in 1990/1991, 25 percent in 1991/1992, and 20 percent in 1992/1993, while total subvention as a proportion of total government expenditure was not to exceed 2 percent, 1.6 percent, and 1.3 percent in 1990/1991, 1991/1992, and 1992/1993 seasons, respectively. Removal of subsidies has been effected through the Fertilizer Subsidy Removal Program, with the target for complete removal of all subsidies being the 1995/1996 season. Government also agreed in principle to eliminate all subsidies on hybrid maize seed during the 1994/1995 season. Only the core poor were to be provided free seed and fertilizer under the Drought Recovery Program during the 1994/1995 agricultural season. The Starter Pack Program in 1998 and 1999 was designed to raise agricultural productivity among resource-poor households through improved access to access inputs. Farmers were issued with small packs of free improved seed and fertilizer, depending on their geographical location and farming system. This has now been redesigned by targeting the beneficiaries and is now called the Targeted Input Program. Remaining government expenditures on agriculture fall into the Green Box category. Malawi has no entitlement to use export subsidies under the AoA. Only four commodities require an export licence. These goods include implements of war other than arms and ammunition; petroleum products; wild animals, trophies and products of such animals; and maize and maize meal. The Ministry of Commerce and Industry issues the licences and frequently reviews the goods for import and export licensing. The licences are valid for six months but may be extended. Standards, including mandatory technical regulations, are set by the Malawi Standards Board on the basis of regional and international norms such as ISO and Codex Alimentarius; they do not discriminate against imports. Although no formal mutual recognition agreements exist, overseas test results are usually unilaterally accepted by Malawi. Sanitary and phytosanitary requirements apply but do not appear generally to impede imports, except for prohibitions on genetically modified food, and meats subject to growth hormones. Malawi applies temporary restrictions, including bans, on imports of animals and animal products from certain countries known to have certain diseases. It has also imposed a ban on such imports, including livestock feed, from the EU because of BSE (WTO, 2002). The Malawi Bureau of Standards (MBS), a member of the International Bureau of Standards, promotes conformity with internationally accepted standards. MBS prescribes and enforces product standardization in Malawi. All products manufactured locally for export must obtain an MBS certification before export. Hotel and catering services are also subject to MBS reviews. In principle, Malawi is committed to introducing TRIPS, but implementation is limited by lack of technical capacity. With a rising poverty level countrywide and the difficulties the Government is facing in meeting its social obligations, it is unlikely that this will be a priority area unless there is foreign assistance. Agricultural exports are central to Malawis trade performance. The share of agricultural exports in total exports has declined only slightly from 87 percent in 1993 to 81 percent in 1999 (WTO, 2002). Agricultural exports have been higher in the post-AoA period compared with earlier periods, although the pace of growth has slowed (see Table 4). Closer inspection of the trend shows that the value of exports peaked in 1998 and has since fallen back. Buoyant prices received for tobacco accounts for much of the post-1995 improvement, and there was little change in the overall volume of exports. The increase in the volume of trade during the 1990s can be attributed partly to SAPs, which were designed to improve pricing policy and the incentive structure of the agricultural sector, as well as promote private sector participation in the marketing of smallholder farmers inputs and produce. The disappointing volume performance can be attributed to a number of factors. While SAPs addressed price constraints, they ignored non-price issues, which in Malawi constitute formidable obstacles to agricultural development. These include market and physical infrastructure as well as investment risk. Additional bottlenecks impinging on trade not well addressed by the SAPs include inadequate producer incentives, unfavourable internal terms of trade and poor access to credit and extension services. Limited foreign exchange capacity to import agricultural inputs such as fertilizer and agrochemicals further weakened the export base of the economy. Agricultural imports increased very significantly between the end of the 1980s and the first half of the 1990s, partly because of increased maize imports in the early 1990s. Since then, until the disastrous harvest in 2002, the incentive programmes in the late 1990s to encourage maize production meant that maize imports faded away, and food imports fell in the post-1995 period. Malawi has always run a surplus on its agricultural balance of trade, and this surplus increased based on the available data up to 2001 in the post-1995 period. However, the bulk of Malawis agricultural exports are non-food crops (tobacco, tea, cotton), and there has only been a slight diversification away from these traditional exports in recent years (see Table 5) The balance on food trade alone has evolved rather differently, moving from a surplus in the late 1980s to a deficit in the 1990s. The reasons for these trends are now explored on a commodity-bycommodity basis. Source: National Economic Council, National Statistical Office, Treasury and Reserve Bank of Malawi. The sharp increase in tobacco exports from 1990 onwards and the slower increases in the years to 1998 can be traced to the entry of the smallholder subsector into the production of burley tobacco, which was an estate monopoly prior to this period. In the 1990/1991 growing season, the Government for the first time granted smallholder farmers a quota of 3 million kilograms of burley tobacco to be sold at the auction floors without requiring that their lands be registered either as leasehold or as freehold. The ban on smallholders growing burley tobacco was completely lifted in 1995. Output from smallholder farmers (with up to 2 ha) has grown substantially, from 69 000 tonnes in 1996 to around 90 000 tonnes in recent years. However, this has been offset largely by declining output from the estates (WTO, 2002). Tobacco prices have fallen in recent years, although in the five-year period to 2000, they were significantly higher than in the pre-AoA period. However, reduced export volumes have led to a reduction in the contribution of tobacco to overall agricultural export earnings in the most recent period (Table 6). The export value of tea has fluctuated around a trend depending on the prevailing level of world market prices, and there is little evidence of a trend, despite an apparent jump in the volume of tea exports in the FAOSTAT data in 2000. The value of coffee exports is much smaller and has been falling steadily since the mid-1990s. The volume of sugar exports has increased in the post-1995 period, although the impact of increased volume on export revenue has been offset by a fall in the unit value of exports. Malawi exports mostly raw sugar, mainly under quota to preferential markets such as the EU, United States and South Africa. Only about one-quarter of Malawis sugar exports are sold on the open market, at much lower prices (WTO, 2002). Maize imports fluctuate over the period 1985-2000, peaking in the early 1990s at the time of a drought, which necessitated substantial maize imports at that time. The high unit price of imports reflects Malawis status as a landlocked country. Wheat imports have been increasing steadily, although a sharp fall in their unit value in the post-1995 period meant that expenditure on wheat imports fell during this period. This is not the effect of food aid as food aid inflows were much higher in the early 1990s period (see Table 7). Dairy imports, though small, show a small increase in the late 1990s compared with a decade earlier. The average per capita calorie intake in Malawi is very low (Table 8). There was a sharp decline in the first half of the 1990s compared with the earlier period, but there was some recovery in the post-AoA period. Virtually all food energy is supplied by vegetable products with very limited consumption of meat and animal products. The share of food imports in total import expenditure increased significantly in the early 1990s, but has fallen back in the post-AoA period as domestic food availability increased. For more than 30 years, government policy has emphasized food self-sufficiency as the main pathway towards food security. The countrys food security agenda has been dominated by maize, a crop which occupies more than 60 percent of cultivable land in the smallholder subsector. Although efforts to develop alternative crops have been made, maize-based research and development in the past have been accorded a high degree of prominence. Thus, it is not surprising that for a long time, a disproportionate share of customary land has been devoted to maize production even in areas where the environment is not suitable for the crop. This ill-conceived strategy could also help to explain the ineffectiveness of extension education in which farmers access to credit was conditional on adoption of improved maize varieties. Approximately two million tonnes of maize is considered sufficient to satisfy the countrys demand. However, in spite of allocating more than 60 percent of the cultivable land to maize alone, production levels have often been below the countrys demand. Only in two years (1999/2000 and 2000/2001) in the past decade has the maize production level exceeded the estimated demand. This was mainly due to government interventions, notably the agricultural productivity investment programme, which expanded access to credit, and the starter pack programme, which provided limited quantities of free inputs to smallholder farmers. Cost implications and sustainability concerns forced the government to reorient the starter pack programme towards resource-poor and disadvantaged segments of the rural communities, thus significantly reducing the number of beneficiaries. The reduction in the size of free input programme was a major factor contributing to the decline in maize production in the 2001/2002 season. In response to drought and escalating fertilizer prices, smallholder farmers have resorted to planting cassava and sweet potatoes in addition to maize in the past decade. The hectarage of cassava is estimated to have increased from 71 919 ha in 1990 to 202 338 ha in 2001, representing an increase of approximately 200 percent, according to Ministry of Agriculture and Irrigation estimates. Output is estimated to have increased from 167 818 tonnes in 1990 to 3.4 million tonnes in 2001. Similarly, the hectarage for sweet potatoes is estimated to have increased from 43 384 ha to 192 457 ha between 1990 and 2001, representing an increase of 300 percent, while output is estimated to have increased from 176 999 tonnes to 3.4 million tonnes over the same period. While it is generally accepted that production of cassava and sweet potatoes has been on the increase over the past few years in the country, there is less agreement on the magnitude of this increase. Some stakeholders have called Ministry of Agriculture and Irrigation estimates of cassava and sweet potato production questionable and even higher than in predominant cassava-producing countries in Africa. In times of low maize production like the year 2002, overestimation of alternative sources of food such as cassava and sweet potatoes creates a false impression about the famine status of the country and delays emergency food aid from both domestic and international donors. Delayed reaction to emergencies resulting from lack of, or poor, information has welfare and financial implications, which could undermine social and economic development. Cereal production shortfalls over the past decade have been offset predominantly by food aid as depicted in Figure 1. 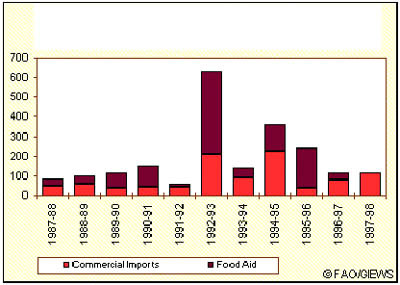 The volume of imports and food aid reached an all-time high in 19921/1993 following the 1992 drought. The trend in cereals aid and imports has been declining between 1994 and 1999. This could be attributed to increased dependence on cassava and sweet potatoes as alternative sources of food. However, surplus production in 1999/2000 and 2000/2001 growing seasons resulting from the free distribution of small quantities of fertilizer and seed to smallholder farmers under the starter pack programme enabled the country to meet its maize requirements as well as export surplus maize for the first time in more than three decades. Figure 1. Malawis cereal commercial imports and food aid (thousand tonnes). Malawi believes that the current round of trade negotiations should have a developmental agenda with five priorities (currently covered under the WTO framework): assistance to develop trade infrastructure, especially for landlocked LDCs; further debt relief; examination of commodity markets and resulting low prices; establishment of permanent institutions to facilitate technology transfer; and creation of a trust fund to ensure that developing countries have sufficient finance to implement their multilateral obligations (WTO, 2002). In agriculture, Malawi believes that developed countries must substantially and progressively reduce trade-distorting domestic support measures as well as export subsidies, with a view to their elimination, while the multilateral trading system should provide more flexibility for developing countries to apply domestic support measures necessary to develop agriculture and food security. Assessment of Malawis interests in the WTO negotiations indicates that there is widespread lack of knowledge and understanding among the Malawi business community of the results of the UR trade negotiations and of the role of the WTO. This is attributable to inadequate dissemination of relevant information to the private sector resulting from severe constraints on human and financial resources in the Ministry in charge of WTO matters. Technical and financial assistance is needed to assist a broader participation in policy formulation in the current round of negotiations. Imani-Capricon Economic Consultants. 2001. The impact of regional trade agreements and formation of a strategy with regard to rationalising participation in these agreements and maximising the benefits to Malawi. Durban, Malawi Trade Policy Project. WTO. 2002. Trade policy review: Malawi. WT/TRP/S/96. Geneva, WTO. Study based on a draft prepared for FAO by Charles Mataya, Malawi.